The performance Within is Milan Tomášik’s solo. In this piece, he works with the simplicity of three elements— sound, light, and the body – which are very precisely structured. Sound and light are made equal to the body and movement, creating a clearly delineated space in which the dancer exhibits his extraordinary technique. We could use the words “beautiful” or “pure” to describe the piece which has a refined dramaturgical structure of successive linked sequences. 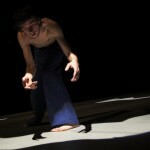 During the performance, it seems that we see and feel the invisible, what is “within”. “It was terrific!…Milan creates a total experience”. 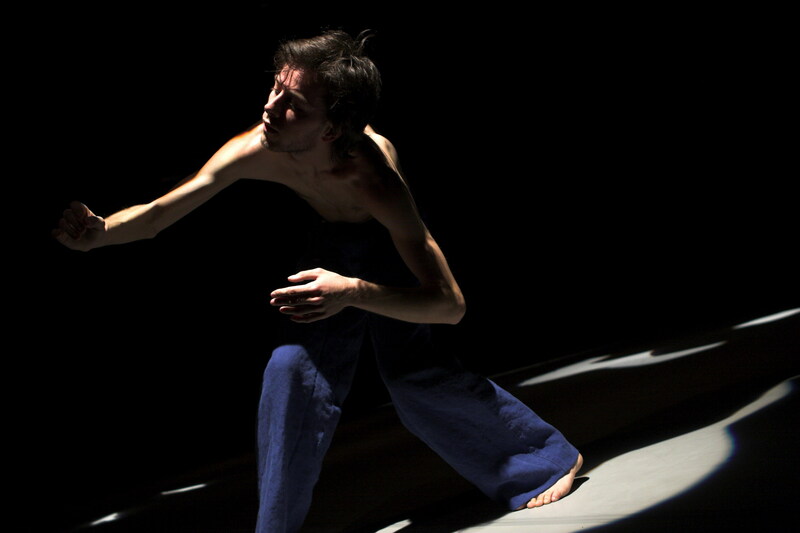 Tomášik’s solo is for Shechter a prime example of what dance can mean. 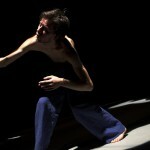 The dance solo Within/Znotraj of the young Slovak dancer Milan Tomášik, who has often collaborated with Slovenian dance scene in the past year, is an unusually sensual performance. The author and his collaborators focused on the theme of diverse layers of perception (sonic, visual, touching) which come to life in the performance as an exceptional, stylistically aesthetic, show. 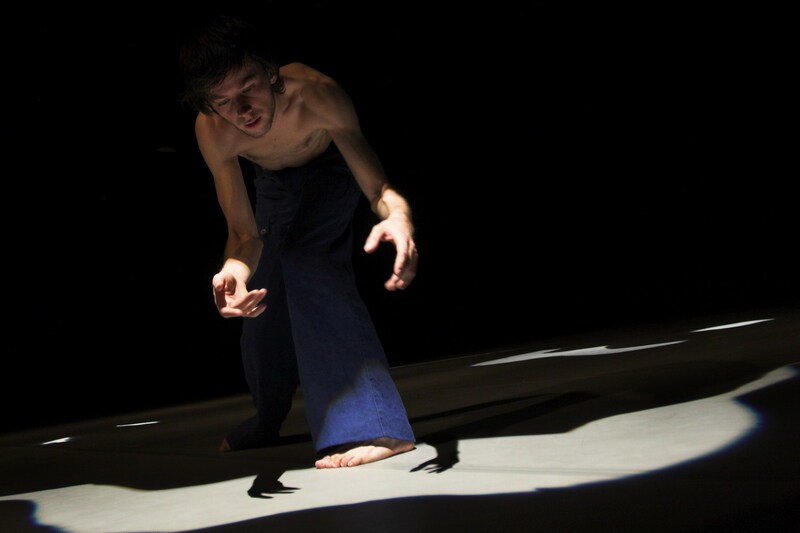 An impressive presence on stage, long-limbed Milan captivates with minimalistic movement in interchanging environments – one almost zen-meditative, one twitching and about to reach the treshold of bursting. The production is highly stylized with use of lights and music, to a point where I wonder if the title Within signifies his entrapment, not introspection. Tomášik moves simply, his steps are childishly playful, reminding of folklore moves, vividly governing the space, forming geometrical patterns, occasionally crossing the space along diagonals, and marking it off in angular shapes. It is mostly the dancers legs that are dancing, stamping, tripping and trampling, while the arms occasionally turn him and send him through the space like a propeller. Between individual choreographically clearly defined divisions, there are moments of brief darkness. In the light game by Davor Balent, together with the music composed by Tomaž Grom, the linear dance sequences of this unusual abstract story sensually flow into one another and across the demarcated stage. 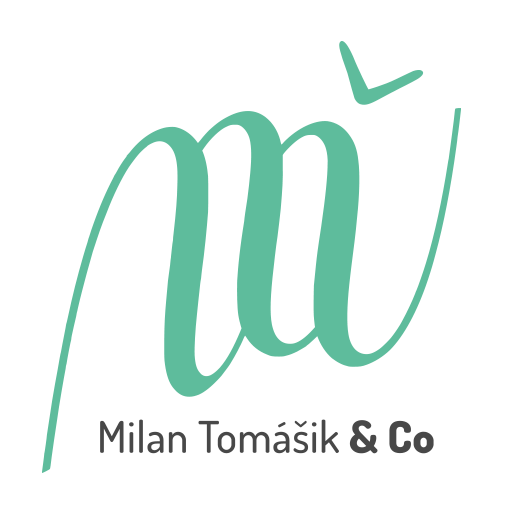 It is its simple execution that makes the dance in the solo piece Within by Milan Tomašik, visibly impregnated by deep consideration, appear sufficiently youthful and fresh. Po křepčení s Les SlovaKs se v pondělí sólově představil jeden ze členů seskupení – Milan Tomášik. Asi nejspirituálněji působící Le Slovak ukázal v choreografii Within svoji intimnější stránku. Pohlcen propracovaným light designem neúnavně vymezoval prostor svým subtilním tělem, jehož výraz nikdy neztrácel napětí ani určitou kontemplativnost. Toto sólo bylo taktéž inspirací k tanečnímu filmu Within 07, kde situace rozehrává již více tanečníků. Kdo tento film na festivalu o několik dní dříve viděl, mohl teď hledat paralely mezi jevištním tvarem a jeho filmovým obrazem.